– Oracle (First Appearance) ??? A taxicab driver named Chester Droars stops by a diner where a television set is on. He sees an advertisement for a used car lot that is presented by the Chicago Bull. This super-freak had been hired for a television show to play a super-powered police officer in the city that lasted only a few months. Chester is informed by chef that Mighty Man was eating there when SuperPatriot came in and recruited him for Freak Force. This claim is laughed off by Chester who returns to his vehicle, lamenting the fact that Chicago is portrayed as being freak-infested despite him never having even seen one. In the Freak Outpost bar, a legion of super-freaks is enjoying themselves when the Chicago Bull bursts in with guns firing into the crowd. He resents being shunned by his fellow freaks over having “sold out” in order to star in a TV show. Weed reaches out and snaps the neck of this would-be mass murderer before RoadBlock calls to the chef for the Chicago Bull’s corpse to be used as meat. Roughneck then enters the bar to declare himself the new leader of the Vicious Circle but meets resistance. As Chester drives through Chicago he notices a deformed figure in the shadows and pulls over when he recognises this man as being Dragon. All of the years of curiosity building up in his mind and Chester grabs the opportunity to question his passenger. He asks Dragon about his position as a role model and questions whether having Rapture, a former prostitute, as his girlfriend is a good example. Dragon dismisses the concerns and states that dating a freak is safer for all concerned and besides anything else; he likes Rapture and does not feel the need to end it purely to appease others. The Rumble Brothers have ambitions of their own towards leading the Vicious Circle but former Annihilators and other villains object. As these super-powered criminals fight, She-Dragon watches on and debates getting involved. She is then approached by her former teammates in the Nixed Men, whom she still believed to be incarcerated. Super-X explains that they had been but after getting transferred to a government slave camp, they along with many others were liberated by Freak Force. They have joined a new faction and will be recruiting She-Dragon whether she approves or not. A behemoth called Slab bludgeons his way through random super-freaks and vows to keep fighting until he has been crowned the new leader. He is confronted by a man who introduces himself as Negate who then neutralises his powers with a mere tough. Slab is left powerless as various Vicious Circle thugs surround him so that they may take revenge. Frank Darling welcomes several new recruits into the ranks of the Chicago Police Department and explains that they are being put onto the streets early due to the Gang War raging through the city. Many of their ranks have been killed or injured and their first assignments will see them thrown into the deep end. One of the recruits is Chris Robinson, the former bodyguard to Peter Klaptin, who also happens to be the alter ego of the vigilante Star. Rita Medermade is struck unconscious as Mako makes his presence known. Phil Dirt calls in assistance but instantly realises his mistake as Mako turns his attention to him. Dragon continues to speak with Chester about potential love interests. He believes that Dart is a lesbian due to seemingly having no interest in men that he has seen. Chester then questions Dragon about his past and amnesiac status but the hero no longer worries about that, his work as a police officer having given him a purpose for this new life that he is living. 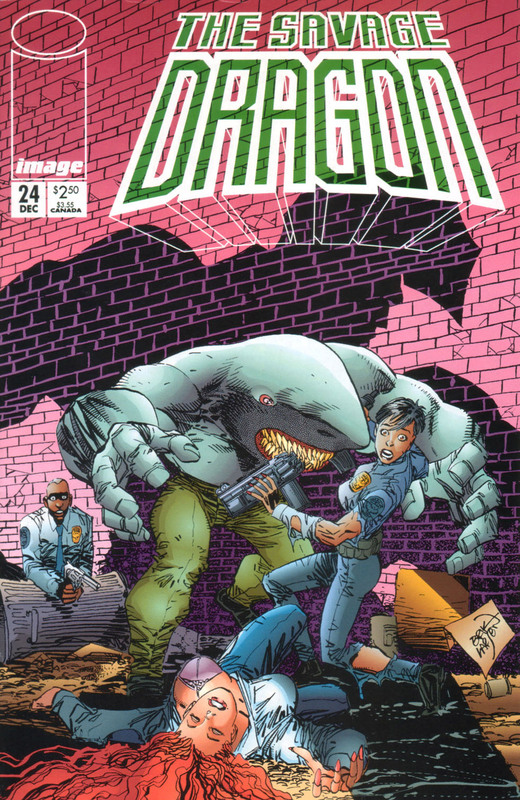 The call regarding the Mako situation is heard over the radio and Dragon has Chester race him to the scene. The super-freak Vandal flees through an alleyway where he runs into Justice, whom he mistakenly recognises as SuperPatriot. Justice explains that he is the son of the aforementioned hero as his sister Loberty announces herself. Vandal dismisses them as not being real heroes but SuperPatriot himself emerges and instantly causes the villain to surrender. Mako stands over the badly bleeding Phil Dirt and explains to the terrified Alex Wilde how he was mauled by a shark at the ground zero of a nuclear missile test. This left him a mutant with a thirst for blood and the counsellors at Stronghold Penitentiary have been having an impossible time trying to get him to change his tastes. As Mako closes in on Alex, Dragon leaps into action. His disfigured state leaves him no match for Mako and Dragon is soon over-powered. Out of the shadows come reinforcements and the villain is taken down. She-Dragon arrives at a hidden location with the Nixed Men where she is shocked to find a large amount of super-freaks gathered. This army has gathered around “Johnny Redbeard” who is rallying them into action. With the Vicious Circle without any clear leadership, it is now time for them to lay claim to the entire city.